A tactical board game of medieval conquest in which 2-6 players assume the roles of provincial Lords of France as the country erupts into a war of succession. Send your brave knights forth to conquer the surrounding lands in an all-out struggle to claim the throne! 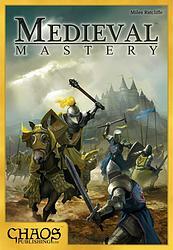 With a playing time of 30-60 minutes, Medieval Mastery is a thrilling game for the whole family - featuring stunning artwork, multilingual support and a high degree of replayability.